It’s a school unlike any other. Located in Bradenton, Fla., IMG Academy is one of about 400 high school boarding schools across the country. It’s the only true sports academy that boards high school athletes. 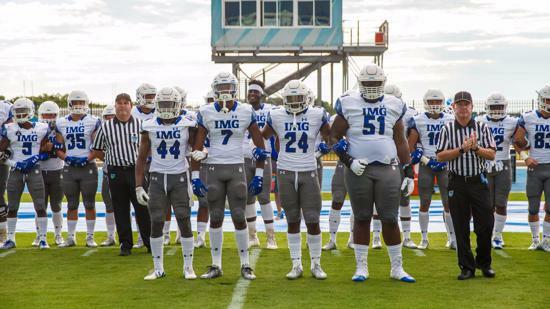 On Saturday, the IMG Academy football team — ranked No. 1 in the nation on the MaxPreps Freeman Rankings, No. 2 by USA Today and No. 3 on the MaxPreps Excellent 25 — plays Corona Centennial in the finale of an Honor Bowl tripleheader, an event that is presented by the San Francisco 49ers. That game kicks off at 7:30 p.m. at Cathedral Catholic High following Helix-Lancaster Paraclete at noon and Hawaii Punahou-Gardena Serra at 4 p.m.
IMG, which traveled to Arizona last week and beat then-No. 7 nationally ranked Chandler in the desert heat, has players from 27 states and 12 countries. Beyond that, IMG has 18 seniors and four juniors who have committed to colleges. There are 12 IMG players on the ESPN Top 300. “Obviously, this is a very unique place,” said IMG coach Kevin Wright, who led Carmel (Indiana) to a 2011 state championship and Warren (Indiana) to three straight state titles. IMG and Corona Centennial met last season when the Honor Bowl was played at Mission Viejo High. IMG squeaked out a 50-49 win. Centennial, which beat Pittsburg 63-21 last week, has a five-star player of its own in quarterback Tanner McKee. Receiver Manuel Allen is a four-star recruit, who has committed to Louisville. The 6-foot-6, 220-pound McKee has narrowed his college choices to Alabama, BYU, Stanford, Texas and UCLA. He completed 203 of 280 passes for 2,522 yards and 36 TDs last season and was 26 of 44 for 374 yards and three TDs against IMG. But two of his eight interceptions came against the Ascenders. Last week against Pittsburg, McKee had 315 passing yards and three TDS. “He has every skill a quarterback needs,” Logan said. Centennial is ranked as high as No. 6 in the nation. The Huskies play with mostly local players. IMG, a coed school/sports academy which has about 1,100 students, runs an international program. “The kids want to be here,” Wright said. “We’re very honest with families when they inquire about our school ... you have to be motivated to come to IMG. We’re very regimented. There is a daily process. “There is a high academic standard. Each student takes five core classes a semester. “Most all our football players take summer classes, so 25 of our 30 seniors will graduate in December so they can get to their college teams. IMG’s daily football schedule is completely opposite from nearly every high school in the nation. Players are up at 6 a.m. and hustle to breakfast, tape and treatment. There is weightlifting at 7:45, meetings at 8:30, film review at 8:55 and practice from 9:40-11:10. Lunch is at noon. Classes go from 1-5:30 p.m.
Dinner is at 6:30, followed by study hall or tutoring at 7:30. At 9:45 p.m., it’s back to the dorms. Lights out is 10:45. The interest is so high that IMG fields two teams — white and blue. Blue is the No. 1 team that travels to Arizona, California, Utah, Alabama and all over Florida. The white team, which plays a local schedule, is coached by former El Camino High, Wisconsin and NFL standout Ken Stills. “We’ve studied the data and it shows kids do better academically if they’re up early, followed by physical activity, then school,” Wright said. IMG isn’t cheap. Tuition varies by sport, but football tuition can run $68,500 with as much as $4,200 in sports fees. Other top-flight boarding high schools average about $55,000 tuition. IMG was founded in 1978 as a tennis boarding academy by Nick Bollettieri. IMG purchased the academy from Bollettieri in 1987 and launched golf in 1993, soccer in 1994, basketball in 2001 and football and lacrosse in 2010 as well as cross country and track in 2013. Since football was started, the Ascenders are 38-3 and have 61 players on Division I rosters. “We want our guys to experience different things, play great programs, play in great events,” Wright said. “The Honor Bowl was an incredible experience last year, and I understand Cathedral is a great venue and is rolling out the red carpet for all the teams. Top football players: 18 seniors — Ayodele Adeoye (Texas), Verdis Brown (Florida State), T.K. Chimedeza (Georgia Tech), P.C. Daniel (Illinois), Curtis Dunlap (Florida), Case Gatlin (Virginia), Brian Hightower (Miami), Mike Jones (Clemson), Shamur McDowell (Minnesota), Greg Newsome (Northwestern), T.J. Pledger (Oklahoma), Brendan Radley-Hiles (Nebraska), Artur Sitkowski (Miami), Alondras Strong (Memphis), Xavier Thomas (Clemson), Taron Vincent (Ohio State), Juan Wallace (Syracuse), Stephon Wynn (Alabama); 4 juniors — Dayavie Hammond (Alabama), Trey Sanders (Alabama), Nolan Smith (Georgia) and Charles Thomas (Michigan) committed to Division I college programs. Notable alumni or professional trainees: Maria Sharapova, Andre Agassi, Monica Seles, Jim Courier, Anna Kournikova, Boris Becker, Serna Williams, Vebnus Williams (tennis); Paula Creamer (golf); Andrew McCutchen, Pedro Alvarez, Joey Votto, Josh Hamilton (baseball); Landon Donovan, Jozy Altidore, Tim Howard (soccer), Jon ISsac, Chauncey Billups, Amare Stoudemire (basketball); Cam Newton, Russell Wilson, Drew Brees, Eli Manning, Alex Smith, Eddie Lacy (football). Boron vs. El Cajon Christian, 4 p.m.
Orange Lutheran vs. Cathedral Catholic, 7:30 p.m.
Serra Gardena vs. Honolulu Punahou, 4 p.m.
Corona Centennial vs. Bradenton (Fla.) IMG Academy, 7:30 p.m.